Two Swedish soldiers, a 28-year-old captain, and a 31-year-old lieutenant, as well as an Afghan interpreter were killed by fire from a handgun in Afghanistan on Sunday. A third Swede, a 21-year-old soldier, was injured, and he was taken to a German field hospital in Marmal, just outside Mazar-i-Sharif, according to military daily news. The Swedish newspaper Aftonbladet reported on Monday that the gunman wore an Afghan police uniform. It was not immediately known if the uniform was a disguise, or if the assailant was a police officer. A group of Swedish crisis management soldiers in the ISAF forces were fired on while they were on patrol slightly west of Mazar-i-Sharif. 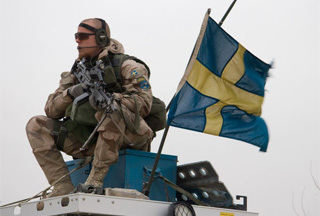 The ISAF forces and a unit of the Afghan army returned fire, but the Swedish military had no information on the possible effects of the counterattack. No Finns were present at the time of the attack. Finnish Minister for Foreign Affairs Alexander Stubb (Nat. Coalition Party) expressed his condolences for the deaths of the two Swedish crisis management soldiers. Foreign Minister Stubb was in direct contact with his Swedish colleague Carl Bildt, and expressed his deep sympathy for the death of the two soldiers.